My computer crashed this weekend but luckily we were able to fix and restore everything. This is a big relief! Today some more (calming!!) white from the portfolio of Trine Thorsen. I hope you all have had a wonderful weekend! Ugh, who hasn’t had that sickening feeling when they see their computer has crashed. Good thing you got everything back! I love white rooms. I just know I personally wouldn’t want to keep them clean. I’ll settle for lots of pretty, white accessories! Ah white, I can never get enough! Glad you’re back in one piece, it’s so scary when computer glitches happen! Oh, had the dreaded computer crash not too long ago (not as lucky as you, lost everything!) Get sick just thinking about it. 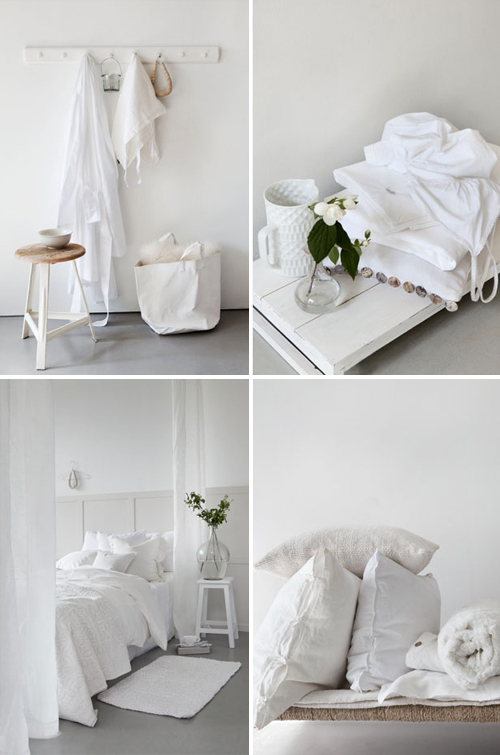 Calming white is always welcomed in my book! the thing is I love white and I love color, so in summer I try a lot of white and when it’s getting colder in fall step by step I’ll bring back something colorful in my home..
White extravagance! It’s amazing how beautiful a basic color can be, and white also opens up the space! Great post. It’s amazing how diverse white can be … ! All the stuff is cool in real sense with white.